Great marketing & sales are critical for the organic growth of any business – the bread-and-butter of building your future. ‘Inorganic growth’ is the 2nd half of the growth equation – mergers and acquisitions (M&A) combining smaller businesses to build scale, scope and capability. 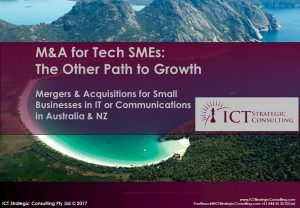 Read the full briefing: Mergers & Acquisitions – The Other Growth Path (ICTSC17). You don’t need a lot of cash, and when you’re ready to retire (or go broke) it’s too late. M&A is not just about an exit when you’re done or ‘getting out of jail’ when you get into trouble. It’s about strategic growth – standing on the shoulders of others, to see farther. You’ve probably got options right now to give you a ‘free kick,’ and years’ head start on competitors. Combined, businesses can often grow 2-3 times faster than each one can alone – in addition to the immediate hit when they combine. 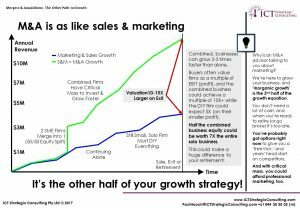 Buyers often value firms as a multiple of EBIT (profit), and the combined business could achieve a multiple of 10X+ while the DIY firm could expect 5X (on their smaller profit). Half the combined business equity could be worth 7X the entire solo business. This could make a huge difference to your retirement!